The passing of Br. John B. Bernard, CSV, (Jean-Baptiste) on Aug. 26, 1890, is considered to be one of the saddest days in the history of St. Viator College. One of three founders of the college, Br. Bernard was called home to the Lord after an extended illness. He was 57. Br. Bernard was born in Beloeil, Quebec, Canada on Nov. 18, 1832. He entered the Viatorian Novitiate in Joliette, Quebec, Canada in 1861. 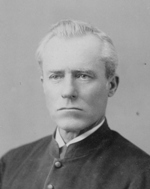 He professed his first vows in Aug. 1862 and his perpetual vows on Aug. 10, 1867. Shortly after his religious profession, he traveled to Bourbonnais, IL and arrived on Sep. 6, 1865. He was accompanied by Rev. Peter Beaudoin, CSV and Br. 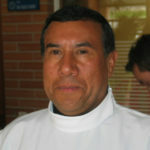 Augustin Martel, CSV. The three confreres would go on to found St. Viator College in Bourbonnais and become known as the pioneers in Viatorian history. Br. Bernard considered the work of his life to be teaching the youth in the local community. Consequently, he began the work of building a parochial school. He taught until Br. Martel left in 1871. At that time, Br. Bernard became the treasurer of the college, a post he held until his death. In all, he spent 25 years of his life in complete devotion to the institution he loved and nurtured. By all accounts, Br. Bernard was considered to be a favorite among students. He was always ready to give them a helping hand, a smile of encouragement or a word of advice. They in turn, truly loved and respected him. The funeral took place Aug. 28, at Maternity of the Blessed Virgin Mary Church in Bourbonnais. The solemn high Mass was celebrated by Rev. Cyrille Fournier, CSV, provincial. Few that knew him could restrain the tears that flowed. A vast number of clergy, relatives and friends joined in the procession to the cemetery. The body was laid to rest in the Viatorian Community plot at Maternity BVM Cemetery.